Going on holiday can pose particular problems in the garden especially how to ensure that precious plants don’t suffer whilst there is no-one there to pander to their needs. As well as deciding what clothes to pack and remembering to cancel the papers, some thought needs to go into how to prepare the garden so it will survive the absence. Usually there is enough rain to provide sufficient water for basic needs, but the weather can be unpredictable. If there is plenty of rain for the borders the lawn will also put on a growth spurt. It is perhaps not a good idea to plant a thirsty plant just before going away. Cutting the lawn just before going will reduce the work needed on return. In summer I have an automatic irrigation system which keeps pots and crops sufficiently watered, if the battery on the timer does not go flat. Loss of water from summer terracotta pots can be reduced by lining the pot with a plastic bag and including water retention crystals in the compost when planting. Going away means the garden has more opportunity than usual to grow out of control. 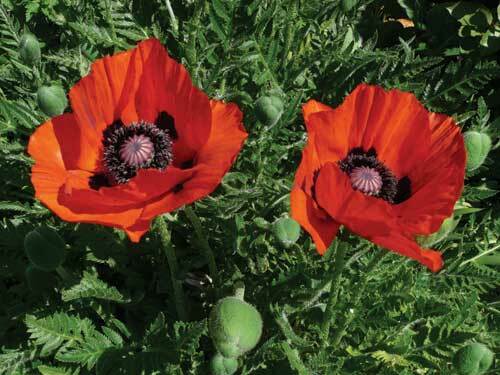 Those flowers which readily self seed might need dead heading before leaving even if still in full flower to reduce the task of having to remove any unwanted seedlings the following year. I have this particular problem with ox-eyed daisies as their self seeding is rather too prolific. However, I find it rather difficult to remove a flower in full bloom and don’t always manage to get this done. Going away also means that the flowering of favourites may be missed whatever the time of year. We have just returned home from a slightly longer than planned holiday and it has led me to think about which plants I would have missed whilst I was away if my absence had been even more prolonged. When the children were at school, holidays were limited by school times and so the longer absence would be in late July/August. At this time of year the garden can be particularly flat after the flush of flowers in May and June, so I was not too concerned about missing anything. Now I am more likely to be at home at this time of year as I have more choice over the timing of my travels so I have put some effort into the mid to late summer garden, but of course I now miss favourites at other times of the year. I have been away in spring when it can be particularly difficult to predict what will be in flower during my absence as this depends very much on how hard a winter there has been. I have just managed to totally miss a rather lovely erythronium which flowered for the first time this year, the yellow bell shaped flowers just developing on our departure and already fading on our return. I also missed tulips at their best and a clump of narcissi which has taken a few years to develop to its present size. Last year a holiday in early July meant that I missed my stargazer lilies at their best, but fortunately managed to enjoy my regal lilies as they flowered a little earlier. I also missed philadelphus at its most fragrant and a September holiday saw me missing the virginia creeper at its most fiery. 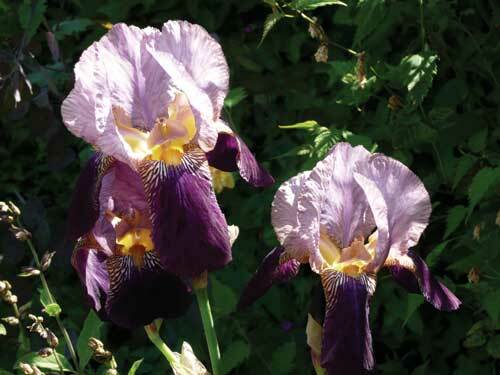 There are those favourites that I would be particularly sad to miss, bearded irises in early to mid May, oriental poppies in early June, jasmine in midsummer. Now that I am also growing vegetables, our recent holiday caused us to miss half of this year’s crop of purple sprouting broccoli and there had to be careful planning of sowing and planting out other crops. So when planning a holiday the timing of all things horticultural is likely to be in the back of my mind. However, as much as I love my garden and hate to miss my favourite plants, they will return to be enjoyed the following year, and I will not let it stop me planning and enjoying future travels.